Take a break from Lisbon with a short trip to Quinta da Regaleira in Sintra, about 36 minutes away. Next up on the itinerary: wander the streets of Belém Tower, make a trip to Praca do Comercio (Terreiro do Paco), meet the residents at Lisbon Oceanarium, and explore the historical opulence of Castelo de S. Jorge. To find maps, more things to do, reviews, and tourist information, read Lisbon trip maker tool . Brasilia, Brazil to Lisbon is an approximately 12-hour flight. You'll lose 3 hours traveling from Brasilia to Lisbon due to the time zone difference. Plan for a bit cooler temperatures traveling from Brasilia in May, with highs in Lisbon at 28°C and lows at 15°C. Wrap up your sightseeing on the 24th (Fri) to allow time to travel to Madrid. On the 24th (Fri), explore the activities along Retiro Park, examine the collection at Prado National Museum, and then admire the masterpieces at Museo Nacional Centro de Arte Reina Sofia. On your second day here, steep yourself in history at Plaza Mayor, then explore the world behind art at Royal Palace of Madrid, and then examine the collection at Museo Nacional Thyssen-Bornemisza. To find where to stay, maps, other places to visit, and other tourist information, read Madrid trip itinerary builder website . You can fly from Lisbon to Madrid in 4.5 hours. Other options are to drive; or take a bus. You'll lose 1 hour traveling from Lisbon to Madrid due to the time zone difference. In May, daytime highs in Madrid are 28°C, while nighttime lows are 13°C. Wrap up your sightseeing on the 25th (Sat) to allow time to take a train to Seville. Kick off your visit on the 26th (Sun): admire the striking features of Metropol Parasol, steep yourself in history at Plaza de Toros de la Maestranza, then learn about all things military at Torre del Oro, and finally admire the landmark architecture of Plaza de Espana. 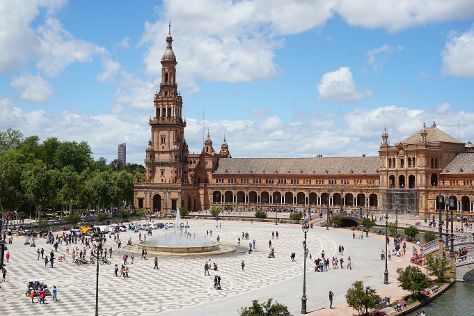 Get ready for a full day of sightseeing on the 27th (Mon): admire the natural beauty at Royal Alcázar of Seville, then take a stroll through Barrio Santa Cruz, then take in panoramic vistas at Torre Giralda, and finally steep yourself in history at Seville Cathedral. To find ratings, traveler tips, photos, and other tourist information, read Seville day trip planner. Traveling by train from Madrid to Seville takes 3 hours. Alternatively, you can fly; or drive. Traveling from Madrid in May, Seville is a bit warmer at night with lows of 17°C. Finish your sightseeing early on the 27th (Mon) to allow enough time to drive to Ronda. Kick off your visit on the 28th (Tue): get great views at Mirador de Aldehuela, take in breathtaking views at El Tajo de Ronda, then snap pictures at Puente Nuevo, and finally don't miss a visit to Plaza de Toros. On the 29th (Wed), you'll have a packed day of sightseeing: experience rural life at Reservatauro Ronda, learn about winemaking at Bodega Garcia Hidalgo, then take some stellar pictures from Mirador puente nuevo de Ronda, then wander the streets of Old City, and finally make a trip to Placa A Los Viajeros Romanticos. You can plan Ronda trip in no time by asking Inspirock to help create your itinerary. You can drive from Seville to Ronda in 2 hours. Other options are to take a bus; or take a train. Expect a daytime high around 31°C in May, and nighttime lows around 15°C. Cap off your sightseeing on the 29th (Wed) early enough to go by car to Granada. 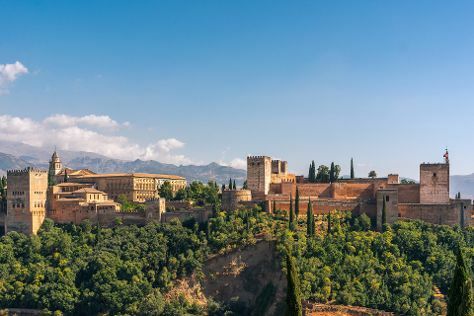 On the 30th (Thu), wander the streets of Albayzin, admire the natural beauty at Generalife, and then admire the landmark architecture of Alhambra. To see photos, reviews, where to stay, and more tourist information, read our Granada trip maker tool . Traveling by car from Ronda to Granada takes 2.5 hours. Alternatively, you can take a train; or take a bus. In May, daily temperatures in Granada can reach 29°C, while at night they dip to 13°C. Cap off your sightseeing on the 30th (Thu) early enough to travel back home.